The Argentinean North East area is one of the main fishing destinations for Golden Dorado Fishing in Argentina. 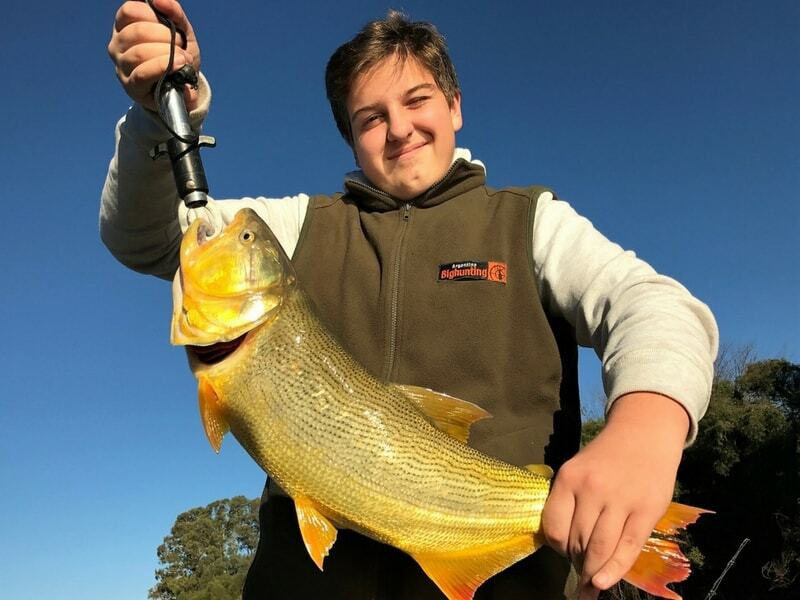 The Uruguay River is one of the most traditional fishing spots for fresh water fishing where the Golden Dorado is one of the highlights as well as other interesting species. Golden Dorado, native of South America, are stunningly beautiful fish with a brilliant golden hue with bright golden-orange tails and fins. They are also called "the tiger of the river" and many people say that there isn´t any other fishing species so aggressive and wrestler. The Golden Dorado attacks lures or flies with ferocious strikes and once you hook one of them, they do multi-acrobatic jumps. They will test your drag with their runs as it is one of the Golden Dorados self-defense mechanisms. Playing a Goldon Dorado provides great excitement as the fight usually lasts for an extended period of time. Trolling, bait cast, spinning and fly cast are some of our fishing techniques we use to catch Golden Dorado. Since they are so aggressive any of these techniques tend to work well. Fly fishing for Golden Dorado can be accurately likened to fishing for giant rainbow trout. They will test even the best fisherman's skills and abilities. Agentina Big Hunting is proud to offer some of the best Golden Dorado Fishing in the world and offer specific travel packages just for this species or you can combine it with either our Big Game or our Bird Hunting. Once of the most adventures is the Cast and Blast. This is a very popular adventure where we combine wingshooting in the mornings and then fishing for Golden Dorado in the afternoons. Since both the fishing and bird hunting are very close to the lodge we can offer this amazing opportunity to enjoy both world class hunting and world class fishing all in the same day.